Let your little one's store their healthy snacks in our Peter Rabbit themed snack box. Designed with the classic tales by Beatrix Potter this adorable snack box is made from an organic bamboo. 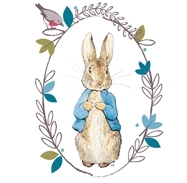 Featuring an adorable illustration of Peter Rabbit, surrounded with floral detailing and a blue decorative rim. This eco friendly snack box includes a cutlery set, ideal for snacking along the way! This snack box is dishwasher safe and ideal for containing snacks and sandwiches, including a rubber band to keep your contents safe this snack box is perfect for picnics, day trips and back-to-school.